Bugs and mice are not the kinds of clients you want wandering into your business! Whether you are a restaurant serving food or an office complex, you don’t need customers associating your business with a pest control problem. 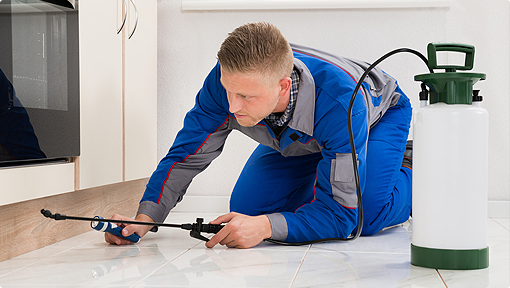 When critters crawl into your commercial property, why don’t you call a name you can trust? A & J Pest Control has been serving commercial and residential properties in the Central Illinois area for over two decades. Are you a preschool, or another business that involves children? Does your office have cats or dogs roaming around? Don’t worry, because we offer child and pet safe eco-friendly maintenance, prevention, and extermination solutions! Whether it’s a trail of ants, a nest of bees, or rats, A & J Pest Control will use our eco-friendly tools to help your commercial property become and stay pest-free with our general pest control services. Contact us today and let us know how Mother Nature’s creatures are plaguing your work environment! Are you having trouble identifying your uninvited guests? Check out our free “Bug-o-Pedia” here! Still not sure? Call us and we will help you identify them! What is Commercial General Pest Control? Commercial general pest control can apply to many different creatures. “Pests” can be defined as a species that can affect your health, the ecology, or the economy. Any species that can scare off customers would definitely affect your economy, so don’t hesitate to call us with your pest control issues! Pest control is at least as old as agriculture, since farmers wouldn’t want critters eating their crops. Now, we have child and pet safe ways to deal with pests and years of experience that you can trust. Click here to learn more about our process! Don’t let pests drive sales away! A & J Pest Control is a family-owned and operated business with over two decades of commercial general pest control experience. We serve all over the Central Illinois area and accept all major credit cards and require no contracts! Contact us online or call 309-360-7422 now to request your appointment!